Forget those often-overlooked front desk check-in screens and say hello to the reception of the future! Always on-time and with a smile, a PRSONAS virtual receptionist is able to greet visitors, present a searchable staff directory, and notify an employee of a visitor via mobile. These digital hosts can be easily updated through an online interface with just a few clicks too. In a large office or building, finding the correct conference room, hallway, or even floor can be confusing and result in an important client or visitor becoming frustrated. Most companies and buildings implement traditional signage, but these signs and maps can only show directions in a 2-D format and cannot answer any lingering questions. Strategically placed intelligent PRSONAS digital hosts can alleviate this frustration by conversing through maps, speech, text, and videos to answer any questions the client or visitor may have. Trust, Equality, Innovation, Social Impact, and Customer Success. You can see a combination of these values plastered on the inside of corporate headquarters across the world. Management teams hope their company's core values can inspire employees to be as productive as possible. Unfortunately for companies, these messages are easy to ignore. PRSONAS digital hosts are able to create a human user experience and communicate with employee core company values and messages that are memorable long after the work day is finished! You have a diverse workforce and bring in extremely important clients from all around the world. How are you able to efficiently communicate with all of them to make their visit and meeting as effective as possible? Hire translators who know every language to stand in your halls and meeting rooms to answer any questions? Nope! 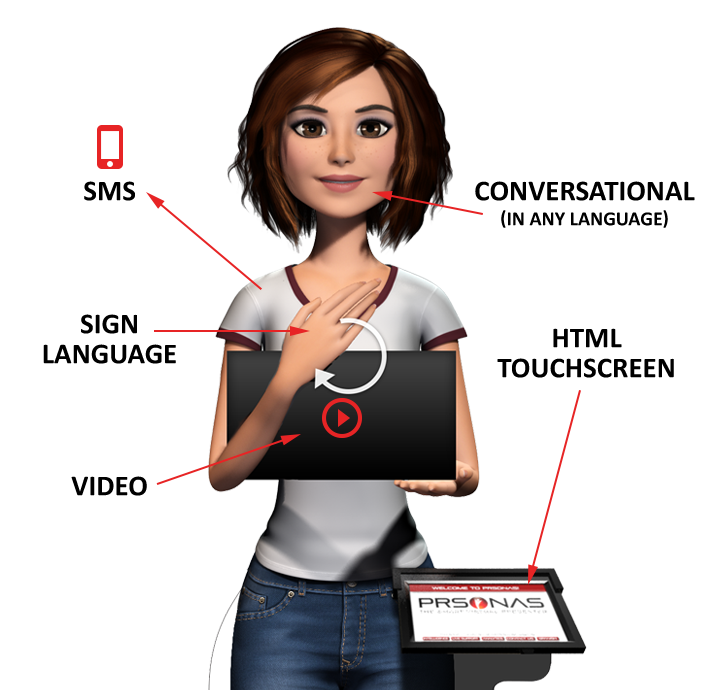 PRSONAS digital hosts can be programmed to deliver information in multiple languages and can communicate through messaging, text, voice, and video. Did I mention sign language? PRSONAS units are terrific tools for effectively providing information about your company to the Deaf Community. Our digital hosts are proficient in ASL sign language delivery. Realistic facial expressions and head movements are another aid to communication.